Some of this post may be things you've read here before but I wanted to tell the new folks a little about me and the herbal products that are being made in my kitchen this month. You can purchase them via email. I've had an interest in herbs for as long as I can remember. It's been a long, lovely journey that has taught me so much. As a young wife, at first it was a sort of awe...or a reserved idea that I knew they offered valuable healing properties but I was hesitant of an unhealthy interest in them for fear I would be delving into realms that would be contrary to my faith. I felt safe buying a supplement here and there from commercial sources but couldn't bring myself to ingest anything I'd grown or wildcrafted outside the common culinary variety, even though I was learning to identify more and more plants in the wild. And with my identification came more knowledge and an appreciation for folk remedies and herbal lore. More faith in empirical evidence and testimony helped me put things in the proper perspective. I realized...or just put into practice... the fact that every good and perfect gift is from above, put here for our benefit. Back in 1991, I had my first child. In a effort to be a stay at home mom who could supplement our income, I had started a dried flower and herb business called The Cat's Meow Herbals and Everlastings when I lost my drafting position in the engineering dept of a local plant due to cut-backs. Still, mostly only admiring herbs for their beauty and aroma, I crafted wreaths, arrangements and potpourri. This led to dabbling in aromatherapy with a natural progression to essential oils. It's been a whole new world ever since! Our little house was full of bundles of herbs and flowers hanging to dry. Spices and fragrances filled the air with a wonderful aroma. My garage was soon full of hanging bundles as my gardens produced more and more. Then, we started building our farmhouse and the garage loft quickly became my workshop. The construction crew joked that it was the best smelling garage they'd ever worked in! With the birth of my second child, it became harder to spend as much time in the shop and I came to the decision that it was not the season in my life to continue a business that took me "away" from home so much. But I never stopped learning and it soon became clear that as much as I loved that type of craft, I could easily expand right into things like the healing herbal salves, soaps and things that I'd been making on a small scale for our family and as gifts. All that to say that we've been preparing natural, additive free products for health, personal and home care right here in our kitchen since 1991 from herbs grown organically in our garden, wild crafted in nearby meadows and woodlands or purchased from reputable, like-minded companies. It's become a big part of our lives and I'd like to share what I've learned and what I've been making. I've realized that I don't need to throw the proverbial "baby out with the bath water" when it comes to herbal lore and application. All the wonderful characteristics of herbal remedies and pleasures are available to me without any compromises required. To God be the Glory! Time to add some items to my long neglected and reworked Etsy shop. See you there in the near future. 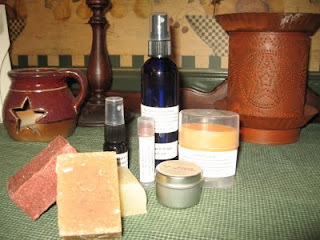 In the mean time, here's a list of currently available products from my herbal kitchen. Watch for the addition of other products soon. Again ~ any medicinal references are strictly from my education, research and experiences. I can assure you that all ingredients have been tested on family and friends with wonderful results and no negative reactions. However, each individual is different and I don't take any responsibility for your health. If you'd like to order, contact me by email @ sharonwallace.61@gmail.com. 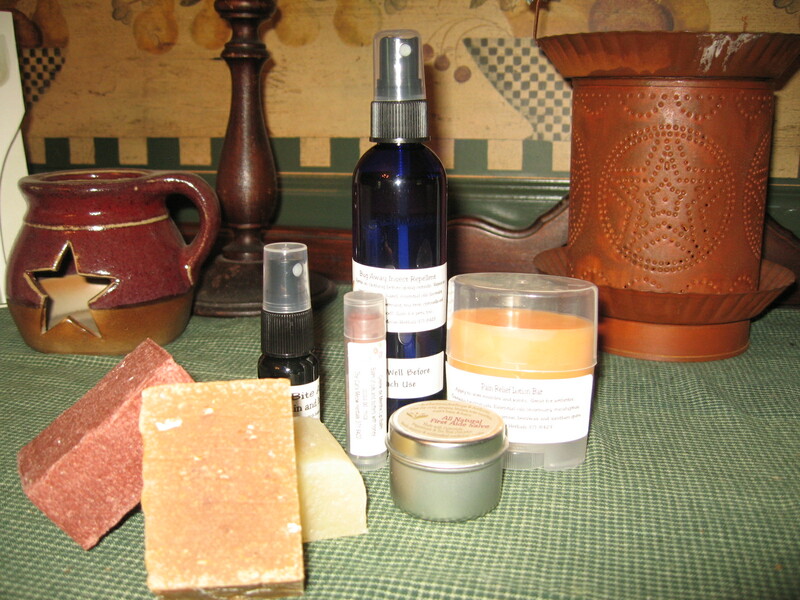 First Aide Salve $4/tin~ made with organically grown and wildcrafted herbs, essential oils, beeswax and olive oil. Empirical evidence and research stand behind this wonderful balm. Use to heal all sorts of injuries, bruises, bites, rashes, diabetic sores and much more. I even used it to speed the healing of a broken toe! Pain Relieving Lotion Bar $5/tube~ A helpful blend of healing oils and herbs that can ease the pain of sore muscles and joints ~ great for arthritis and muscle injuries ~ made with oils, beeswax, herbs and xanthan gum. Bite Away $4/bottle ~ a soothing, mild, blend of essential oils in a witch hazel base to take away the pain and itch of insect bites and stings. Safe enough for the little ones, too. Bug Away $6.50/bottle ~ a blend of essential oils that are known to repel insects, including ticks, in a witch hazel base. Vapor Salts $4/jar ~ a blend of essential oils in a salt base that can be dissolved in a pan of hot water to release vapors that are both soothing and able to break up congestion. Grapefruit Mud Mask ~ a bar formulated to combat acne and heal delicate facial skin. Astringent and drying for excess acne. Use 2/weekly for sensitive skin or up to daily use for troubled teen skin. Rosemary Shampoo Bar ~ a cleansing blend of oils that give your hair that squeaky clean feel. Follow with a lemon juice or ACV rinse. Coco Butter Castille ~ a very mild pure bar of soap that is wonderful for the entire family, even pets. Gardener's Pumice Bar ~ contains mild exfoliating agents to remove stubborn ground in dirt, healing honey, aloe and tea tree essential oil and a saponified oil blend. Cold Cream Facial Bar ~ an unscented blend of saponified oils and homemade cold cream for a gentle, moisturizing cleanse that removes makeup while leaving behind a dew kissed glow. Within the continental US, shipping is $2.50 for the first item and $1 for each additional item. If you've used any of these products and would like to testify to their effectiveness, please feel free to comment below. Thanks! I am going to place an order with you in the fall. Getting delivery of almost all your products would be difficult since we are in extremely high temps now. I've tried ordering soaps, etc. before but they arrive in a puddle. @Jenny Love to hear from you! Yes, high temps make me nervous about shipping. It's still a learning game for me.